Who was the best pilot I ever saw? Well, uh, you're lookin' at 'im. Back when Philip Kaufman was still attracted to interesting material and making bold choices. This manages to be genuinely rousing, without seeming too "America the beautiful", by contrasting the seven pilots in the space programme with the previous generation’s Chuck Yaeger. There’s no pretence that cynical politics aren't the main determining factor in events. Add to this, there’s the coverage of the crazed media circus that followed the space race and superbly designed special effects that stand the test of time because (as Kaufman puts it) they have searched for the visceral reaction rather than a look of perfection. This is a dazzling film, beautifully photographed by Caleb Deschanel. The casting is perfect too; Dennis Quaid, Sam Shephard and Ed Harris are the ostensible leads, but Fred Ward is resonantly sympathetic as the ill-fated Gus Grissom (whose exploding hatch incident is presented ambiguously here, but the retrieval of the capsule in '99 confirmed his version of the incident). 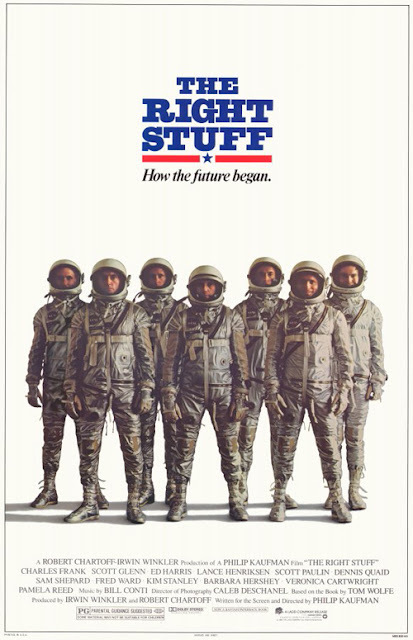 The Right Stuff was a bit of a lame duck on release, attributed in part to identification with John Glen's presidential campaign, but looking at the original trailer it translates nothing of what makes the film so compelling. One of those films where three hours seem to pass in minutes.